Specification: HorsePower: 1/15HP Max Flow: 670 GPH @ 1' of Head Cord Length: 10ft Shut Off @ 20.3ft of head Voltage: 115V Hertz: 60Hz Amps: 2.5A Watts: 208W Certification: UL/C-CSA Warranty: 1 year manufacturer's warranty. Little Giant 3E-34N (503603) is a 1/15 HP, dual-purpose (In-line or Submersible) Pump with 10ft power cord and an oil-filled motor). For commercial, industrial, and home applications including statuary fountains, water displays, air conditioners, machine tool coolants, and many other applications where liquid must be transferred or recirculated. It, however, is not recommended for aquariums, swimming pools and fuel oil transfer. This compact 670 GPH pump features a 1/2" MNPT discharge and 20.3' shut-off head capability. SUBMERSIBLE PUMP: It Is ideal for commercial industrial and home applications including statuary fountains, water displays, air conditioners, machine tool coolants, and many other applications where liquid must be transferred or recirculated. 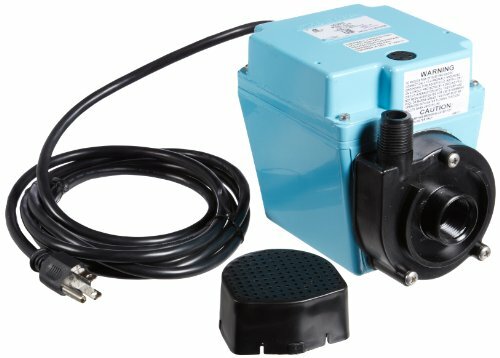 OIL-FILLED MOTOR PUMP: Little Giant 3E-34N (503603) is a 1/15HP, dual-purpose (In-line or Submersible) Pump with 10ft power cord and an oil-filled motor. DUAL PURPOSE PUMP: This compact 670 GPH pump features a 1/2" MNPT discharge and 20.3' shut-off head capability. IN-LINE PUMP: This pump is runs at 300 GPH and is a dual purpose, oil-filled pump. It's designed to move water out of areas like shallow flooded basements as well as other home and commercial use. OIL-FILLED PUMP WARRANTY: It is epoxy coated die-cast aluminium housing and has 1 Year warranty.